In the several years since I last wrote concerning this topic, a very considerable amount of new documentation has emerged on the Yak-11 programme. The new research reveals all manner of details about Yak-11 manufacture, and quite interestingly as well, a formidable amount of data regarding the painting and finish of these aircraft. As a result, it is high time to revisit the subject of Yak-11 and C-11 colouration and update our knowledge of their respective appearance. A.S. Yakovlev was always a designer keenly interested in training aircraft. It is perhaps for this reason that all of his Yak family of fighters were developed into training variants of one form or another. It was also undoubtedly true that Yakovlev's fighters were all possessed of outstanding handling and control properties; features which made them idea for the training role. It was fitting that the last last of the Yak family of fighters, the wonderful Yak-3, was also duly so developed. Work on an advanced fighter trainer based on the Yak-3 had already started at the Yakovlev OKB by 1946. Following detailed investigations of the Yak-3U ASh-82FN and the matter of installing a radial engine in the basic Yak-3 airframe, Chief Engineer Shavrin began work on a two-seat training variant powered by the 700 hp ASh-21 radial. The prototype, originally called "Yak-U" (U= uchebnii, or 'trainer'), was completed in May 1946 at Factory 292 in Saratov and commenced manufacturer's testing under OKB Test Pilot Klimushkin. All aspects of flight behaviour and maintenance were found to be very satisfactory, and the trainer passed its State examinations in the same year as the 'Yak-11'. As has now become evident, the rate at which the VVS revised its ideas and practices regarding aircraft finish and camouflage in the immediate post-war period was extraordinary. It seems clear that the Army and the Government were not at all satisfied with the somewhat 'haphazard' nature of many wartime finishes. After all, it is a central tenant of all military forces, everywhere, to insist upon uniformity and regulation, two words which had virtually no relevance whatever to the 1941-45 appearance of most of the aircraft in the VVS. However, that being the case, there was also at the same time an evident re-emergence of the Sky Camouflage theory within the VVS (which we should recall dominated such thinking in the late 1930s). New fighter designs which entered series manufacture from 1947, for example, all demonstrated this type of finish, and used newly developed lacquers which were very clearly intended for this type of scheme. Additionally, the Government and the Army now faced the considerably different prospect of operating a peacetime military force, the priorities for which were rather different to that of a wartime service. Economy played a major role, naturally, and so such factors as the longevity of aircraft finish came to the fore. During the war, no airframe was expected to last as much as two years; in peacetime, the Government hoped that aircraft structures would last ten years. Wood, and wood-laminate construction, which had played such a superb role in aircraft manufacture under wartime conditions, was suddenly seen to be hugely undesirable. Such structures would not last anything like the desired amount of time when exposed to the elements, and so a general policy took hold of replacing all wooden (or mixed) VVS aircraft with ones of all-metal construction. With respect to aircraft colouration, the VVS reverted its behaviour to that of a peacetime service, as well, very much as it had done prior to 1941. From late 1945, it was no longer required that military aircraft should be camouflaged, and particularly those in rear areas or training formations could once more employ single-colour upper surface 'non-camouflage' type liveries. The green finishes (AMT-4 or A-24m, depending upon the construction method) were seen to be the most suitable for this application, but some use was also made of AMT-12 Dark Grey and other similar colours. Moreover, a new series of gloss finish paints called AGT were developed alongside the AMT (matte finish) line, with identical nomenclatures and colours to the lacquers in that system (e.g. AGT-4 Green was identical to AMT-4, but featured a gloss finish). VIAM had determined that a gloss finish would make these lacquers more durable and hard wearing, and so training aircraft and other similar types (transport, sport types, etc) were thusly recommended to make use of the new finishes (a gloss finish was obviously not suitable for front-line combat machines). The first Yak-11s were completed at Saratov during 1946-47, totalling 68 examples altogether. These early machines were of all-metal construction internally, but did feature wood-laminate sheeting around the cockpit and the aft fuselage, as with the wartime Yak-3, as well as fabric covered fuselage sides. Perhaps for this reason, the MAP (Aviation Ministry) decided that the new AGT lacquers would be suitable for Yak-11 production employing a non-camouflage AGT-4 over AGT-7 livery. For the purposes of 'UV protection', the MAP also specified that lacquer AII Aluminium should be used as an external primer over all surfaces, supplanting the more usual ALG-1 primer. Various other minutia were described in the new finishing instructions, such as the 'standard' dimensions of the national insignia, the placement of tactical numbers, and other such like; clearly, the enhanced regulation of a peacetime Air Force was manifestly evident. 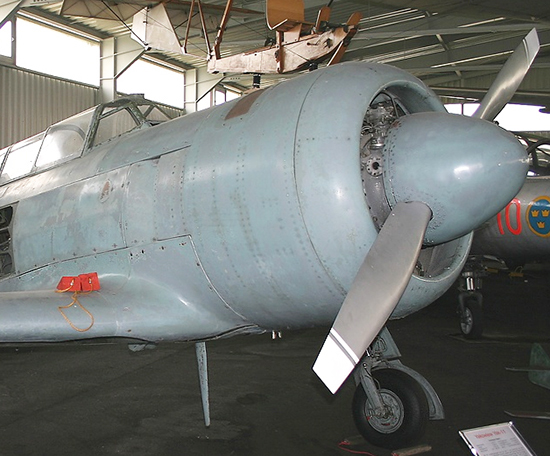 As a result, the first series Yak-11s built at Saratov looked like this example. Tactical numerals, when applied at the factory, were specified to have been placed aft of the star marking on the fuselage. The gloss finish of the AGT lacquer is notable, as are the 'regulation' size and parameters of the national insignia. Some dark examples of these early 'mixed' Yak-11s are notable in the photographic record. Although it is generally impossible to distinguish between lacquers A-24m and AMT-12 on b/w photographs, it is my own thought that these examples were painted with the latter, grey colour. The MAP's instruction for the Yak-11 finish were extensive, and while AMT finishes were discussed on an 'in case of' basis, A-m lacquers were conspicuously not mentioned at all. Therefore, the following profile depicts and early 'mixed' Yak-11 in AMT-12/-7 colouration. During 1947 manufacture of the Yak-11 was increased. The new series replaced the wooden sheeting around the cockpit and upper rear fuselage with dural sheet, so that-- minus the fuselage's fabric sides-- the aircraft was effectively an 'all metal' design. At the same time, the Government became increasingly frustrated by the costs associated with maintaining wooden aircraft structures in the VVS. Teams of carpenters and aircraft painters were dispatched from the large wartime fighter manufacturing plants (Saratov, Gorki, Novosibirsk, etc) to units in the field to help to restore airframes which had become compromised by moisture (and poor maintenance practices, one assumes). These repairs ran into the several thousands of units, and much discussion took place in Moscow about possible remedies. Somewhat ironically, the Government soon came to question the wisdom of its decision regarding the use of primers on the Yak-11 programme. While AII Aluminium was no doubt effective against UV rays, it was certainly inferior to the usual primer, ALG-1, as regards protection against moisture. Therefore, with the MAP in a state over the costs of fighting moisture deterioration in the VVS, the use of proper ALG-1 priming was immediately reinstated. Surface finishes remained as before, primarily making use of AGT-4 and -7. Early examples were often seen without maintenance stencils, but by the spring of 1947 these were common. A number of developments occurred in Soviet aviation manufacture during 1947 which were to have a significant impact on the Yak-11 programme. In the first instance, the arrival of two new all-metal fighters for the VVS (La-9 and Yak-9P) seems to have been the catalyst for a formal re-introduction of Sky Camouflage theory. Two new lacquers were introduced, AMT-16 Blue-Grey and A-36m Grey, which were clearly intended for this type of scheme, harkening back to identical ideas of the late 1930s. AMT-16 was a soft grey colour with a slight blue tint, while A-36m was extremely similar in colour to the old finish AEh-9 (light grey), which was the very paint used for 'sky' colouration before the war. Moreover, not only were the two new colours introduced, but new formulations of each exibiting a gloss surface finish (when new, of course) appeared as AGT-16 and A-36g, respectively. At the same time, the Government's dissatisfaction with the current aviation lacquer situation boiled over. There had already been letters issued by the Chief of the Air Force to the industry regarding aviation painting, the first in July 1946 (regarding the use of gloss finishes), and subsequently again in January 1947 (regarding all-metal aircraft finish). Apparently these were not sufficient, for in August 1947 the MAP issued Order No.549 which demanded that, henceforth, the Yak-11 would be finished with a single-colour application, preferably using AGT-16 (the use of A-36g was also discussed). On the heels of such a strongly worded Government edict, there followed the usual bureaucratic fumbling to enact the new regulation down to the factory level. In this effort both VIAM and the MKhP (Ministry for the Chemical Industry) became involved, looking to assure that quantities of the new paints with sufficient quality control would be available for use in manufacture. Meanwhile, the Directorate at Factory 292 assured the MAP that Yak-11s would leave the facility wearing the new finish no later than October 1. In the event, it is hard to determine exactly how many Yak-11s were painted this way during 1947. However, by the New Year (1948) a single-colour AGT-16 livery was certainly the standard finish, and essentially the Yak-11 was now to wear a Sky Camouflage application as with fighter aircraft, excepting that it was to employ gloss versions of these paints. The classic Yak-11 appearance was thusly born, as shown below. And here finished with A-36g. The proportion of aircraft completed with A-36g seems to have been modest, and certainly was very much less than AGT-16. The exact number of such examples, however, remains unknown. It might also be noted that 1948 brought with it another new lacquer for use on the Yak-11. For the first time, the MAP decided upon the creation of special purpose internal aircraft finish, to be used in cockpits and various crew positions. This new paint was called DK-23 Grey, and was accompanied by an external version (of the same appearance) with the designation A-23m. Both new lacquers, perhaps not surprisngly, bore a remarkable similarity to the older aviation primer ALG-5 (a pale green-grey colour), which the Goverment has recommended for such internal use previously. Both featured a matte finish, and from 1948 the standard interior paint on the Yak-11 was indeed DK-23. During 1948 production of the Yak-11 at Factory 292 (Saratov) reached 871 examples. However, even this impressive total was insufficient for the requirements of the VVS' training programs, and therefore series manufacture of the Yak-11 was launched at Factory 272 (Leningrad) in 1949. In 1950 production of the type halted at Saratov, whereupon Factory 151 became involved in the Yak-11 programme, but only to a modest degree, and thereafter main centre for the Yak-11 programme remained at Leningrad. The finish of the Yak-11 in series manufacture at these facilities did not change. The usual application was a single-colour AGT-16 livery, with intermittent examples seen in A-36g. A few aircraft (some 240 examples) were completed at the end of the programme in Leningrad (1954-55) with a new aviation lacquer named KhVEh-16, which was identical in appearance to AGT-16 (but featuring all-new chemistry). In all, around 3700 Yak-11s were completed in the USSR from 1946-55 [various sources give the figures 3622, 3701 and 3859, respectively]. In 1952 the Czech aviation company LET was awarded a production license to manufacture their own examples of the Yak-11 as the C-11. Czech-built C-11s were virtually identical in all respects to Soviet Yak-11s, and indeed many of these aircraft were made against contracts placed by the USSR for use within the VVS. Poland, as well, placed orders for Czech C-11s as did Austria, and a further proportion of these aircraft entered service with the Czech Air Force. Noting that the VVS was the main customer for the C-11, it may not be surprising that LET built aircraft were identical in appearance to Soviet Yak-11s. The standard C-11 finish at the factory was an over-all application of the same blue-grey colour; whether this paint was actually AGT-16, or an identically appearing Czech equivalent, is currently unknown. Be that as it may, Yak-11s and C-11s in service in the VVS are indistinguishable in the photographic record. C-11s initially enetering service with the Czech Air Force were finished similarly, as shown here. National insignia were not applied to the fuselage sides in Czech A.F. service, where large four-digit codes or civil registrations appeared, usually in black. Most examples exported to Poland seemed to have been finished in AGT-16. However, a slightly disproportionate number of such aircraft seem to be finished with A-36g (as compared to the VVS), which might be a case of preference by the Polish Air Force, and which were probably Soviet built Yak-11s (no C-11s were known to have been finished with this lacquer). Further, at some subsequent point in Czech service (which is not currently understood), many C-11s in the Czech Air Force or serving within SVARZAM (the State Flying Club), were finished with a grey-green colour of local manufacture. This paint, whose nomenclature is not known, did not exhibit such a gloss finish as AGT-16. The photographic record suggests that LET did not complete any C-11s at the factory with this finish, and that these examples were all painted subsequently. The examination of aircraft delivered to Egypt shows the application of this grey-green colour to obscure the Czech national markings, but the base, underlying finish was AGT-16 (or equivalent). Aircraft delivered to Austria were similarly painted with AGT-16, which was then over-painted by a local light grey colour in Luftstreitkräfte service. LET C-11 (factory no.171229) preserved in Graz, Austria. The application of a local grey paint over the original AGT-16 surface is manifestly evident. LET completed 707 C-11s by the end of manufacture in 1956. Four C-11U trainers (with nose wheel, tripod gear arrangement and increased fuel capacity) were also built. Yak-11s and C-11s were widely exported during the period 1955-65. Many of these aircraft served in the same liveries with which they were originally completed, but some seemed to have been refinished entirely, and a few in very colourful fashion. This C-11 number "56" was photographed in at Gebel al Basur, Egypt, ca. 1961. An unknown lacquer, perhaps a dark grey paint, was used to obscure the original markings, but most of the finish remained AGT-16. Aircraft with the number "37" in Algerian service, ca. early 1960s. This worn old example (possibly a Yak-11) was photographed in the Yemen during the 1960s, serving alongside several MiG-17s. No tactical number or other such unit marking was in view. An appliqué of dappled colour-- perhaps green-- was present on the cowling and fin, and the port aft most access panel appears to have been a replacement from another machine, still in its original AGT-16 finish. The locally applied camouflage colours are unknown, and here shown in estimation, only. The Yak-11 was also one of the favourite recipients in the USSR of "custom request" or commemorative paint finishes and schemes. Numbers of Yak-11s were painted to represent Yak fighters of the wartime Normandie-Niemen regiment for such feature films as "Baltic Sky" and "Normandie-Niemen". DOSAAF routinely obtained custom finished Yak-11s, often with their logo painted on the side and featuring various coloured trim and other devices. Commemorative schemes were not uncommon, these usually recalling pilots or events from the war. A number of Yak-11s were famously painted in wartime AMT-11/-12/-7 colouration, complete with NKAP Template patternation, as part of the 5th Anniversary of Victory Over Fascism celebrations at the Cadet Academy, Monino (Moscow, 1950). Aerobatic flights also made use of brightly painted Yak-11/C-11s. Of these, the examples seen in the DDR were probably the most striking with their over-all red colouration and bold white trim. This example was seen in the VVS' acrobatic flight at Kodinka Airfield, Moscow. The originally suggested date of '1962' seems to be too late for such an example, and perhaps the year is a typo for '1952'? Alas, despite all efforts by the author, the photograph depicting this aircraft yas still not been re-located, and confirmation of its various details might have to await that discovery. A healthy number of these lovely aircraft-- most of them LET C-11s from the shipments made to Egypt-- are still flying today as part of the world-wide 'Warbird' scene. Some of these examples sport colourful civil liveries of various description, but the majority seem to be painted in mock "Russian wartime camouflage" schemes of widely ranging appearance. It must be said that virtually all of these "military" finishes are completely fanciful and bear no semblance of any kind to authentic period VVS colouration nor markings. Given the long service life of the Yak-11 / C-11, its fascinating history, and the genuinely colourful finishes worn by proper examples, it is difficult indeed to understand why so many such aircraft are painted in this faux manner. Perhaps it is high time for a proper re-evaluation of Yak-11 finish within the Warbird community?